I absolutely love seeing your puppy birthday parties! 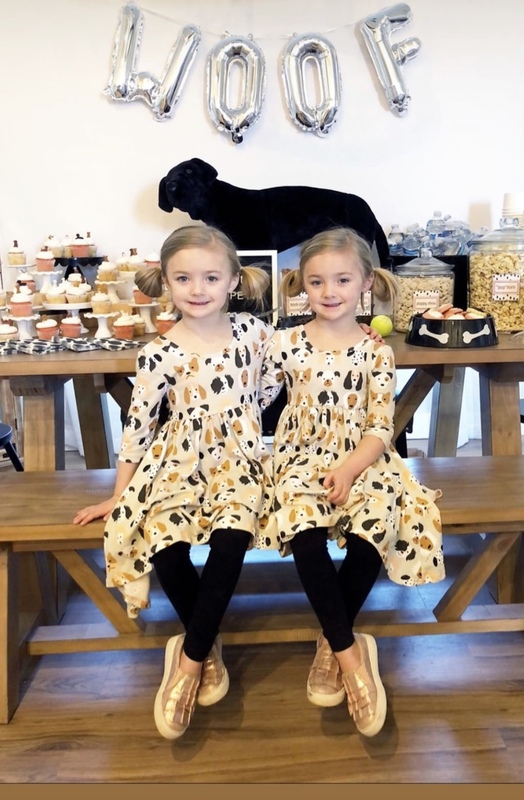 Sarah Capp, owner of Five.Twenty.Nine Designs hosted the cutest party for her twin girls. Here’s a look at this fun puppy party! Created using the puppy party printables from Diane Robison Design on etsy. Diane also can create custom prints/invites etc.. if needed. Taylor Joelle Puppy Dresses of course! How fun is it to have dresses that match your invites and decor? We will be restocking the puppy tutu dresses in rust (with short sleeve this time) early March. Swing dresses are available now. This is where it gets so fun! Each guest was able to “adopt a puppy”. Look how many there are to choose from! Then they create a collar for their puppy using colorful beads, and can also decorate their own puppy carrying case. The cupcakes are topped with these cute mini puppies from Amazon (same ones we used with our Valentines). Yummy snacks to munch on included: puppy chow, pup corn and dog biscuits. Such a perfect puppy party! Thanks Sarah for letting us share! We are so happy to connect with Christina from @littleboholoves on Instagram. Christina threw the most fabulous puppy party, and she’s allowing us to share with you guys! I haven’t posted all the pics from her party, so check out her instagram to see more. The shirts her girls are wearing are Taylor Joelle Designs. We are out of most of the shirts, but we will launching this same print in swing and tutu dresses! These will be ready in January. I’m obsessed with the color scheme of the party. The “WOOF” balloons are my favorite. You can purchase rose gold balloons from amazon. I love how Christina used cut paper to recreate the dogs from the girls shirts. And how fun and simple is this cake? I love that tiny party hats she’s made for the small dog figurines. Plus the girls can keep those cute cake toppers. And what’s a puppy party without real live puppies! How epic! I would love to recreate this someday for Cohen’s birthday. If you are planning a puppy party, keep Taylor Joelle in mind for the perfect puppy dresses! We will also have a boy version of these tees (coming soon). Cohen has decided that he wants to be Vampirina for Halloween. I totally thought he would have chosen Rapunzel, but after our big birthday party, I’m excited for a change. I was concerned when I opened the paint because it was rock hard. As soon as I took a wet paint brush to it, the paint moistened up and went on really easily. My son Cohen is turning 5 in 2 weeks, so we have been prepping away for his birthday party. He’s a princess loving boy and his new obsession is Rapunzel. I wanted to make a braid for each party guest. I looked up some tutorials and most of them involved yarn. I tried to do a sample one and it was trickier that I expected. I knew there had to be a simpler way. Someone sent me a link to one done in fabric at Hanna Andersson, and I thought YES! Fabric should make this project much easier (and cheaper). Each headband costs about $3 to make. So, I’ve made a video about what I did to make these fleece Rapunzel braids. They will make perfect party favor’s to Cohen birthday guests. Yellow Fleece Fabric – 1.5 yards made 5 headbands. The last two I made were thinner braids since I was getting low on fabric. If you want them all to be thick braids, I would do a little more). Purple Ribbon – this is for weaving into the braid. I bought a spool at the dollar store and ran out after 2 headbands. Fake Flowers – also purchased at the dollar store. 3. Give them each a few packs of pokemon (from the dollar store) and have them play with their cards. We’d called it Pokemon day! Now time to make it happen.